If you’d like to own a home in the city but fear you’ll never be able to afford it, the Office of Jonathan Tate may have some good news for you. 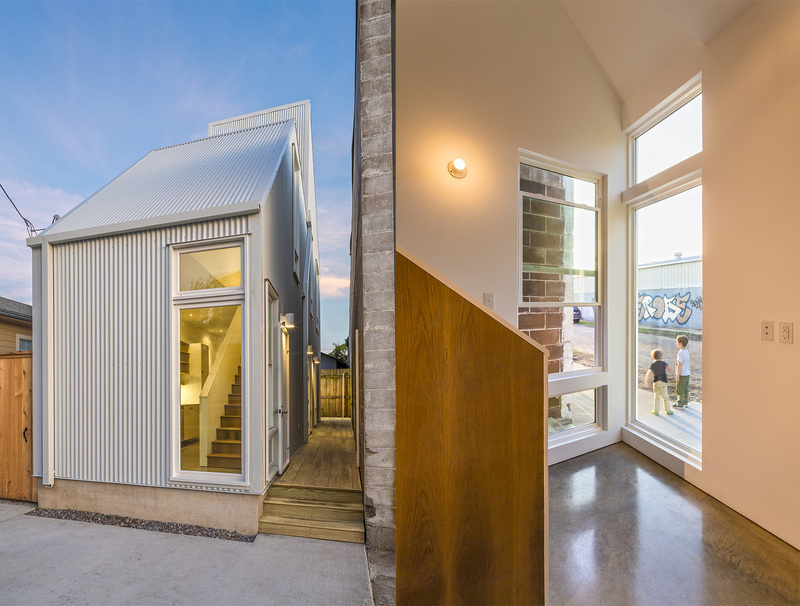 The New Orleans-based architecture firm and developer Charles Rutledge have launched a housing experiment to transform oddly shaped urban lots across cities into valuable housing stock with tiny but thoughtfully designed homes. The Starter Home* project will offer affordable, entry-level homes targeted at first-time homebuyers. 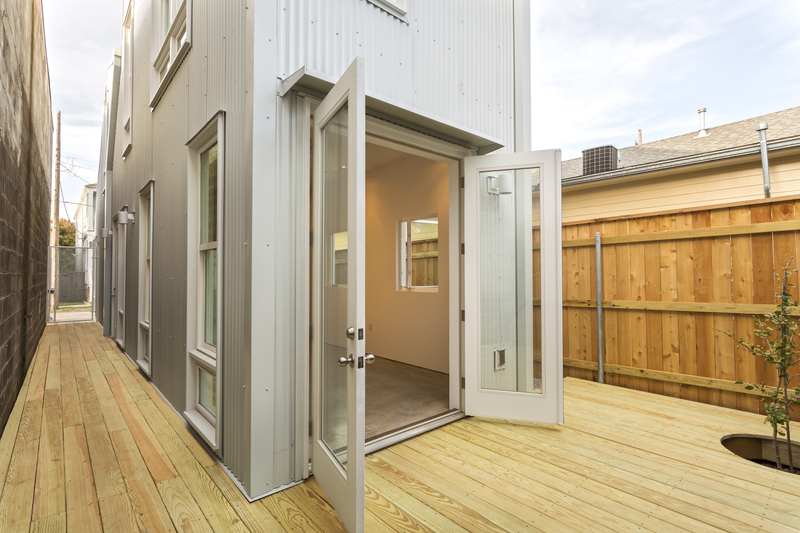 The first test site is in New Orleans, where Starter Home* completed its first home, called No. 1, located at 3106 St. Thomas St. on a very narrow lot in the city’s Irish Channel neighborhood and historic district. Clad in corrugated white metal, the 975-square-foot tall and slender home is topped with a zigzag roof and braced with an interior vertical steel truss to protect against hurricane gusts. The three-story structure stacks a loft, bedroom, and bathroom above a kitchen, dining room, and living room. The starter house is currently on the market for $339,000; the higher-than-expected price will help Starter Home* recoup the initial development cost. Future units are expected to be more affordable thanks to economies of scale. The team presently has between 15 to 20 more site-specific homes in the works for New Orleans, and has plans to expand their infill development project to Oakland, California and beyond. The Starter Home* project combines thoughtful site-specific design with real estate speculation that uses GIS analysis to identify vacant lots in favorable locations that, often because of their irregular shapes and small size, are considered undesirable by conventional developers. The first test site is in New Orleans, where Starter Home* completed its first home, called No. 1, located at 3106 St. Thomas St. on a very narrow lot in the city’s Irish Channel neighborhood and historic district. Clad in corrugated white metal, the 975-square-foot tall and slender home is topped with a zigzag roof and braced with an interior vertical steel truss to protect against hurricane gusts. 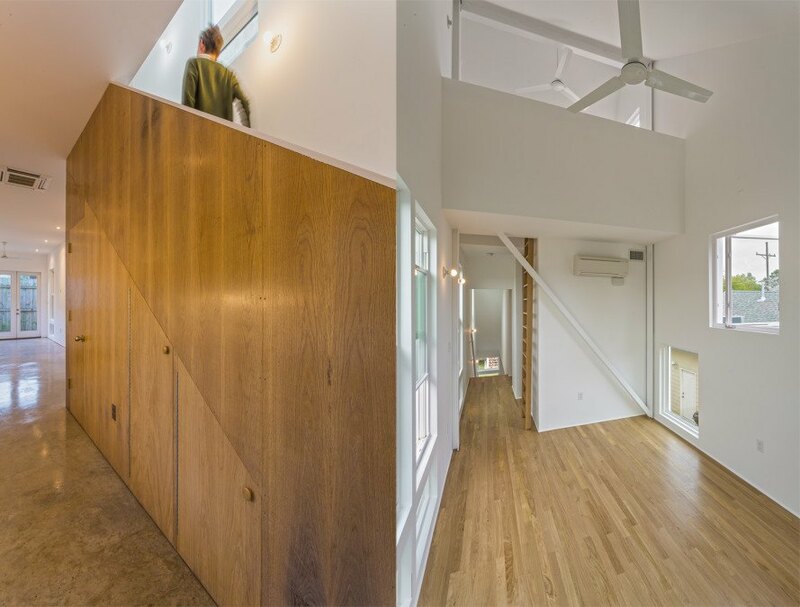 The three-story structure stacks a loft, bedroom, and bathroom above a kitchen, dining room, and living room. The starter house is currently on the market for $339,000; the higher-than-expected price will help Starter Home* recoup the initial development cost.